There are many beautiful lace designs for machine embroidery available. Although the designs are dense with thread, they do need tulle to hold together. A heavy weight water soluble stabilizer is perfect to keep the tulle stable in the hoop while the design is stitched out. Gather the materials you will need to machine embroider lace designs. Embroidery Thread and Bobbin Thread - It is preferable to have a bobbin thread that matches your embroidery thread. 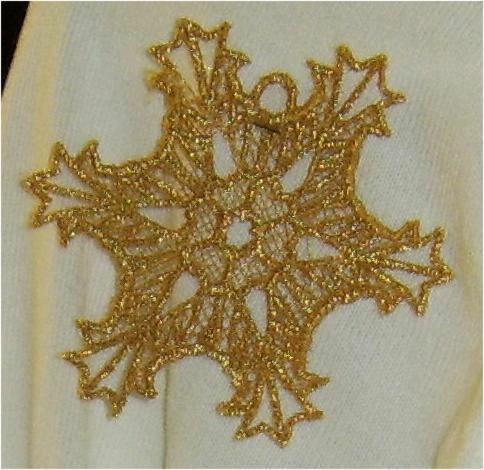 We planned on hand sewing these snowflakes to a cream-colored shawl so I used cream colored tulle. Sandwich a layer of tulle between heavy weight water soluble stabilizer. Place the sandwich in your machine hoop keeping all layers taunt and smooth. With the sandwich taunt and smooth, stitch out the lace design. Remove the stitched out design from the hoop and trim away all excess stabilizer and tulle. Although the tulle will rip away from dense stitching, it leaves a frayed edge. It is much neater and safer to use small embroidery scissors to trim the edges. Dissolve and rinse the water-soluble stabilizer away. Use the lace as desired. In this example, we had a knitted shawl that needed to be spiced up for a fancy affair however we didn't want the design to be permanent on the shawl. By hand stitching the snowflakes to the shawl, they are removable to have a plain shawl later.